I appreciate all the phone calls and emails about the historical house theme we have going here. This is a resource not just to my credit but for a whole bunch of people, most of whom know a bazillion times more local history than I. I am still having some difficulty getting around the "downtown" area because not only is the median being redone; the side street drainage is also. But I did manage to find four beauties today. 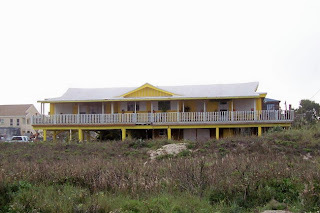 The Sears house called the 'Seventh Day' was built in 1973 and is still popular as a Gulfside beach house, being very well maintained. Steve Hathcock referred this house to me as possibly as real old timer on Sunny Isle St. He wasn't sure of the exact history and the owners weren't exactly sure if they wanted me to shoot a picture of their house. 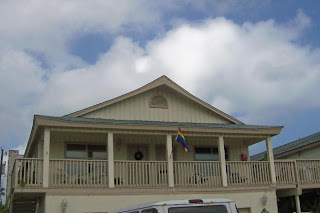 I do see some similarities with the old Coast Guard House. 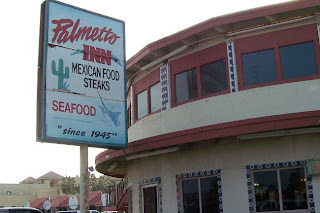 Above, the Palmetto Inn is included, along with its curved front aspect, which is highly unusual anywhere. The sign says "since 1945" but according to local knowledge, that is when the family first started their restaurant business. The present building was built in the mid to late 1950's, still impressive. It is a true cultural landmark. 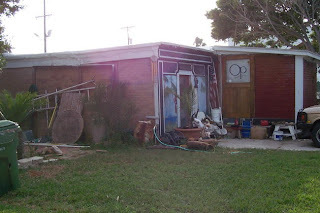 Here is the last "surfer" trailer left on the Island, due to squatter's right's one would suppose. From an aerial view you can see how a bubble-top 1950's travel trailer was joined up to other partitions. 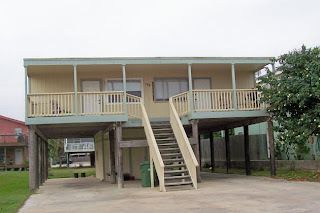 This is the last stand for a mobile trailer park of about six permanent trailers. Is my job done yet? Absolutly not. 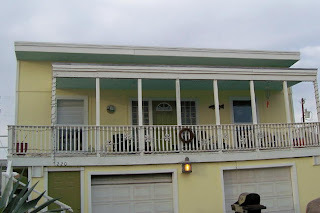 There are more cool houses of historical interest locked away in places all over the Island. 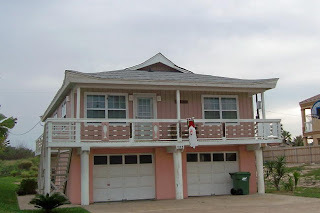 I need to verify the location of John L. Tompkins office, for example, and shoot one or two bayside boat houses which have those funky Tiki roof-lines. 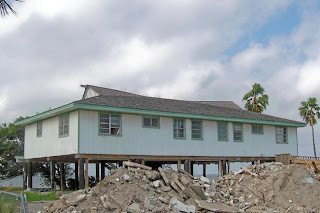 One Island friend has volunteered to help find old telephone books from the 1950's through 1970's so as to see if the old house is still there, an interesting concept. I am not sure of the history of Ila "The Turtle Lady" house other than many said it was of significant historical significance on the Island. 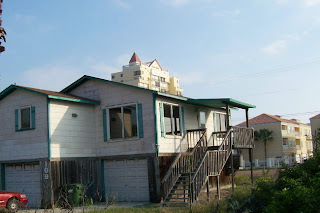 It certainly has a modernist or "Bauhaus" style described by its rampant cubism, as opposed to other "Tiki" or more conventional beach house styles. The SPI Historical Committee will be working to fill in all these gaps about a lady who not only started the effort to save sea turtles but also was an aviator and owned her own amphibious craft to commute to the mainland. I will continue to collect more historical sites but simply could not proceed without a testimonial to this wonderful lady. Update on Januery 2, 2007: please cick here for more about Ila. On Wednesday I was able to get back out on the streets for the southern end of the Island, which was more of a challenge with all the construction "downtown." I couldn't be as thorough and will add some more as I happen across them. 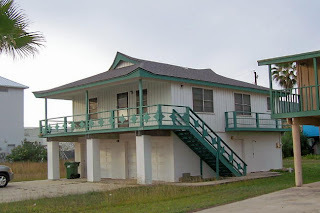 Of all the historical treasures on the Island, perhaps Jim's Pier is one of the best. It was originally built in the early 1950's but was remodelled every few years - even today there were workers fixing the docks. Before that time there were probably some old fish camps on the bayside. Below, six more pictures have been added. This ole building by Ace Hardware looks like it should have some kind of history! 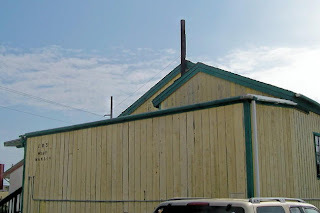 Update from Troy: this was the old Pico Lumber Company that started in this exact building. Not a good sign. 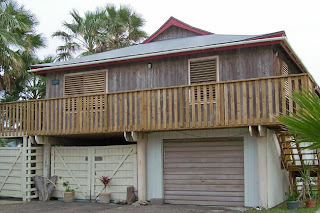 Here is another of the larger Tiki houses on the Island, noteable for its original cedar shake roofing. I have no idea if it will be moved or simply torn down. 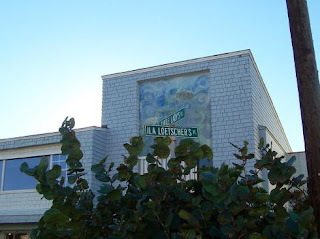 This is located down on Tarpon Street. 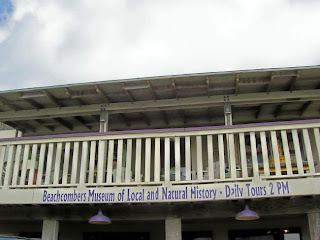 Here's the Beachcomber's Museum on Pompano. Steve Hathcock ways it used to be a residence and after a bad storm the bottom floor was raised up on pilings and added onto. It is quite a good museum, by the way. 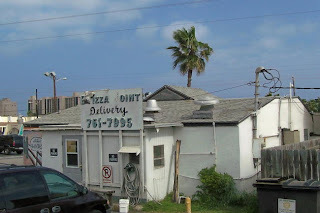 This is the backside of D'Pizza Joint, once reported to be the old jail and cop shop. Back in those days, this was the "downtown" area on Stillman's Landing St. I haven't a clue if the landing was used as such, but the old jail looks as to be doing just fine. Here's one of the structures by the Upper Deck establishment on Atol Street, another example of the Tiki roof design. 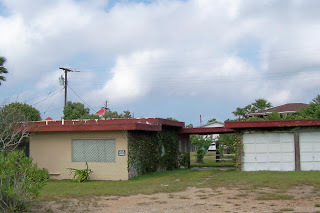 Scattered throughout the Island are a few "modernist" structures which do have some architectural significance. They are usually one story buildings built from block quite low to the ground. This one is on Marlin Street and is noteable in that I was only able to capture a little over half the house, which was built in connecting cubes. 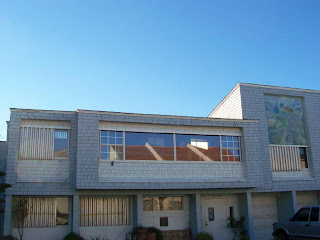 Amazing Walter sent over a few photos of some historical beach houses, which I like to share here. Please credit Walter "Amazing" McDonald for these. 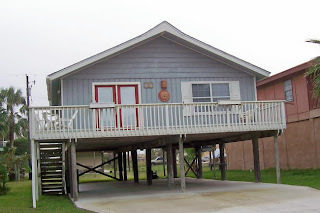 The first one shown above is the old Coast Guard House which was located on Isla Blanca a long time ago. 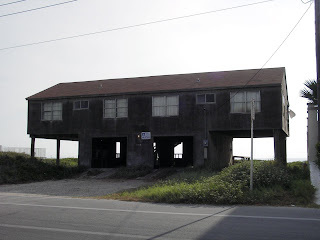 Somebody hauled the building, which was used for sleeping quarters for the Coasties when on duty, to its present site right on the main drag. Amazing entitled his email "Save the Shack." I'd like to do that although a source tells me it may be infested with termites. While there used to be more barracks and structures for the Coast Guard and mlitary sources, this is the last remaining one we can find. 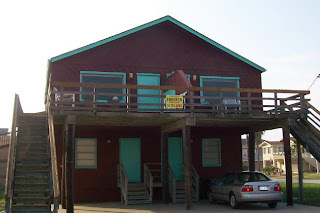 If anyone has any stories about the "shack," please feel free to post a comment. 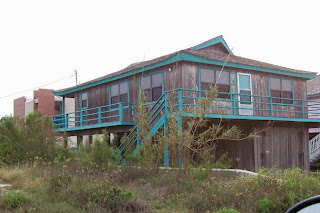 The second one below is the beloved "Sand Ho" beach house, right on the Gulf. 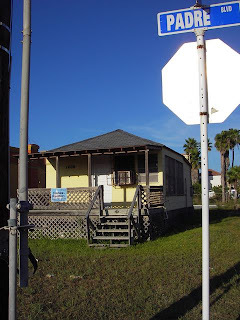 There are few old wooden houses built on telephone poles left along the Gulfside. My suspicion is that most were taken out by Beaulah or constructed since then, when the use of concrete pylons and slabs became much more popular. The units are still being rented, last I checked. Welcome to the SPI History Channel. I had wanted to call the blog "The Hysterical Society" but better judgment prevailed. Basically, I volunteered to shoot some pictures of the older structures on the Island for JoAnn Evans and the Island Historical Committee. I was worried because some bad weather was coming in and a huge fog bank was roiling right off the beach ... but for an amateur, not bad pictures today. I hope you enjoy these pages as they grow. If you have any pictures of historical significance by all means feel free to share them here. By no means is this a comprehensive study, although with small steps maybe a larger picture will emerge. 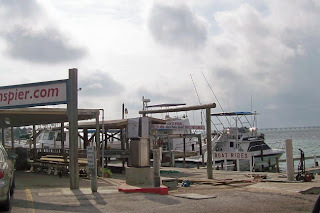 Today's photo essay starts at the northern end of the Island. Most of the structures I shot were "Tiki" or Polynesian-inspired designs, all beach houses, with a few 1970 flat-tops thrown in the mix. I found a dozen in about an hour before the light failed. When the sunlight comes back and I have another hour, I'll update things with a Part 2. If there's anything to say I'll put it under the picture as a caption, just so we don't get lost here. Capricorn St. The "swoop" or pitch of the peak and roof edges can vary greatly, and is a lost art in roofing which is why so few remain - nobody really knows how to rebuild them. A neighbor on Capricorn St. 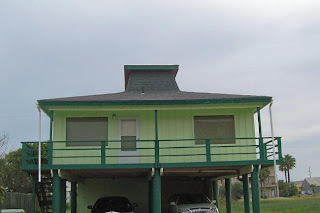 The last house was a simple pitched roof but this one is a hip roof with a 'widow's peak" at either end. I am not sure why these peaks were built, as they serve no function for attic air circulation. One thought is that the wind deflection from these designs made them withstand the hurricane winds better. Gulf by Venus St. The lift on the roof overhang is pretty impressive. Saturn St. This one has had the roof redone, maybe with polyurethane or something. It is one of the larger Tiki structures on the Island. This architecture is a little difficult to place, although it certainly has some Polynesian or Hawaiin influences. 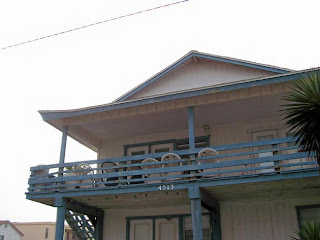 Huisache St. 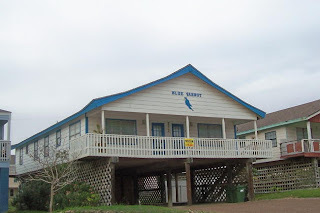 Many of the old beach houses had names such as the 'Blue Parrot' here. 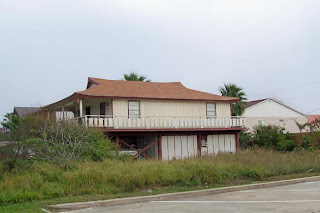 Lantana St.
One of the cutest houses is located off Retama. The curved wood must be cut specially with a jigsaw - no straight lines used on this house! This one has had the benefit of concrete and plaster downstairs, since all when originally built were open on the ground floor. Hibiscus St.
Hey isn't that my 1970 beach house?